Relatives of a 73-year-old gilets jaunes demonstrator who was injured in a police charge are to file a complaint, the family's lawyer has said. 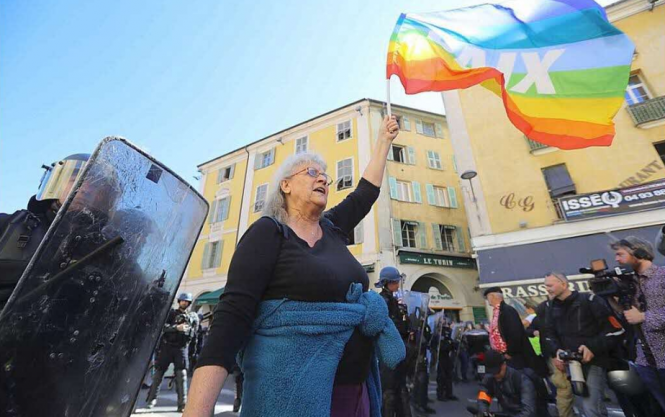 Genevieve Legay, described as 'someone who fights for peace' by her daughter, was hospitalised after the incident in Nice's Garibaldi Square during a gilets jaunes' protest on Saturday. CCTV footage from the square has been collected. Both local prosecutors and France's justice minister have pointed out that protests in some parts of the city centre - including the square in which the incident occurred - had been banned due to a high-level international talks between President Emmanuel Macron and Chinese Premier Xi Jinping. Ms Legay's daughter later said that her mother had suffered several skull fractures and 'subdural haematomas'. The 73-year-old is an activist with the social justice campaign group Attac. The group has published a message on its website calling for an inquiry to establish who was responsible for her injuries. The organisation has called for a rally in Garibaldi Square on Monday, March 25 at 6pm. Attac 06 et de nombreuses organisations appellent à un rassemblement pacifique en soutien à notre amie Geneviève Legay. She is described as being 'in a serious state', according to her lawyer. But reports that she was in a coma have been dismissed. " She is not in intensive care but hospitalised in the post-emergency department for surveillance. Her daughters are with her and her family has all the information about her health," a doctor at the hospital told Nice Matin on Sunday. "What worries us is that the prefect has given the hospital extremely firm instructions not to communicate outside, including with the family, who have great difficulty in obtaining information," the lawyer said. Nice prosecutor Jean-Michel Pretre said they were doing everything they could to find out what happened. But, he said: "When you stay in a protest after the regulatory (police) warning that people have to disperse, it's a crime." "We have no right to forbid pacifist people to gather and show their discontent," Ms Legay's daughter told France Bleu Azure.